It's known as "Greener's Law," and it is one of the most fundamental principles of media spin, especially the political kind: Don't pick a fight with someone who buys ink by the barrel. But as Republican Congressman Devin Nunes is learning, the same thing applies to milk in the Twitter age. 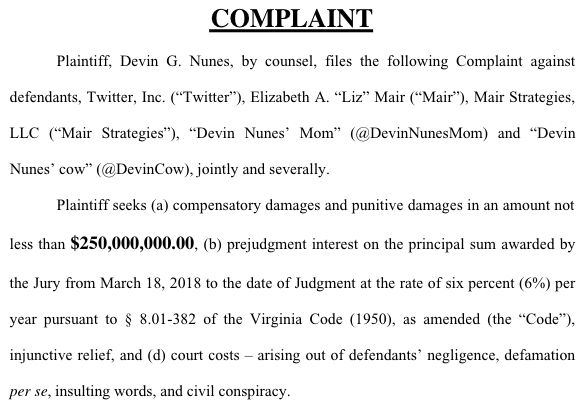 When Nunes filed a $250 million defamation suit against Twitter and two Twitter accounts -- "Devin Nunes' Cow" and "Devin Nunes' Mom" (suspended) -- he did exactly what the adage advised not to do, throwing lactose-based fuel on the fire. 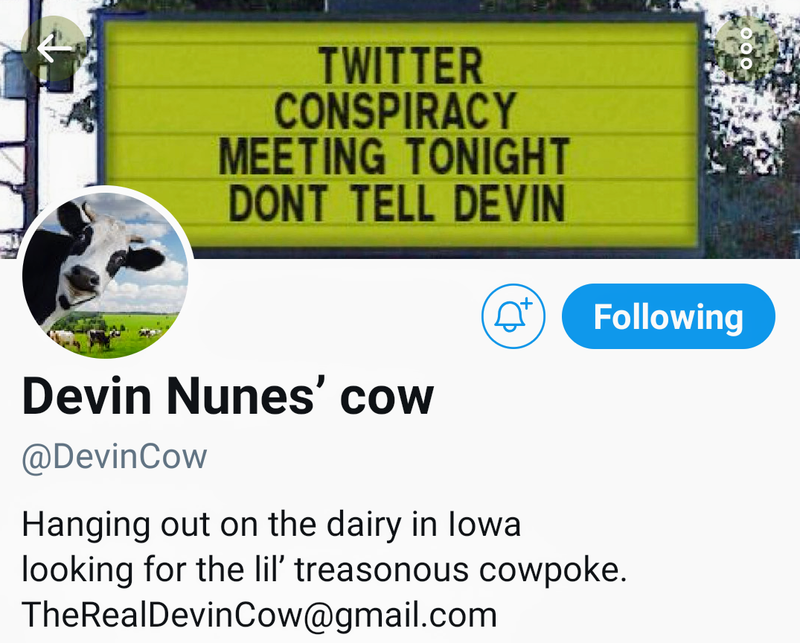 At press time, @DevinCow had ratcheted up to 352,000 Twitter followers, closing in on @DevinNunes' 394,000 and the jokes and memes circulated across Twitter and well beyond it, including most of the late night talk show monologues. The attention Nunes' suit drew to the parody account peaked so much Tuesday that when a cow was found roaming -- and stopping traffic -- on New York City's Major Deegan Expressway, it turned into inevitable punchlines about Nunes. While legal experts deem Nunes' suit to be frivolous, its social media effects have proven devastating. It also comes at a time of heightened Republican establishment criticism that social media is politically biased, including -- of all people -- the President of the United States, who went to Twitter to say he "will be looking into" an allegation that Facebook blocks @realDonaldTrump's social media chief Dan Scavino Jr.